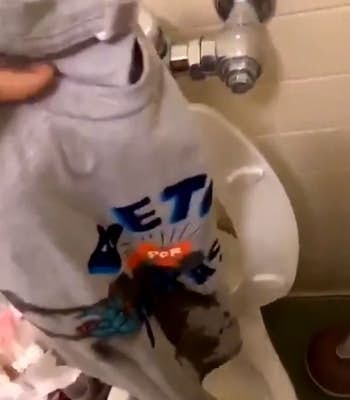 Police at the University of North Texas are investigating after a social media stunt in which a student urinated on a Beto O'Rourke shirt and then gave it away to a supporter of the Senate candidate. The video, posted Wednesday morning by Twitter user @Bebe_celeste1, shows a male student —identified as Chandler Davis on Snapchat — posing in a "Make America Great Again" hat and then making vomiting gestures at a UNT rally urging students to vote. Next, the student is apparently shown filming himself urinating on a campaign T-shirt and dropping it into an unflushed toilet. The video then shows the student approaching a group of young people standing on a sidewalk at night to offer them the shirt. He asks if anyone wants a free Beto shirt that “got soaked.” A woman accepts the tee. Student response to the video was swift, with multiple people tagging the Twitter accounts for UNT President Neal Smatresk and the school’s social account. The school's verified account responded to one tweet: “We are aware of the video and are actively investigating the matter. Thank you for bringing it to our attention.” Students have been asking for updates ever since. UNT police were still investigating the incident Friday, university spokeswoman Leigh Anne Gullett said. “All UNT students are held to our student code of conduct, and we expect the UNT community to represent our values of respect and compassion,” the school said in a written statement. While UNT’s Code of Student Conduct has no specific clause on assault by bodily fluids, the offense could fall into a broader category such as harassment. Penalties for violating the code can range from warnings to expulsion, depending on the violation.